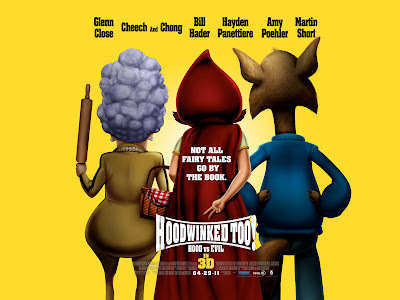 from the team that brought you Hoodwinked. Click on the poster for a sneak peek. The sequel catches up with a teenage Red Riding Hood who teams up with the Wolf to investigate the disappearance of Hansel and Gretel. Augie Dawgs and I were amused by the references to other movies and although some of the humor was lost on five year old TOF, he was still able to follow the plot and laughed himself silly. The movie is rated PG for some mild rude humor, language and action. Parents us your own judgement. Disclaimer: My family was invited to attend a special screening of the movie. I was not asked to write about it, nor was I compensated in any other way. The opinions are my own. The notion of Glenn Close in the same cast as Cheech and Chong makes the idea of seeing this movie worthwhile, in and of itself. I've gotten to the point where I LOVE the animated movies made for...uh...children. The animation is beautiful and the interaction between the characters is always more enjoyable than watching a movie with human "stars".